White supremacy in America was even more extreme and savage than in South Africa, says the noted scholar. AMY GOODMAN: And then you have in the United States a movement around accountability, overall. It’s the 50th anniversary of the Selma Bloody Sunday, March 7th, when John Lewis, now a congressman, and scores of others had their heads beaten in by Alabama state troopers. It’s 50 years later, and you have the Black Lives Matter movement. You have these stories repeatedly around the country of police officers killing young people and not-so-young people of color. What do you make of this movement? And do you see the anti-austerity movement in Europe, the accountability movement in the United States, the movement around climate change—do you see these coalescing in any way? 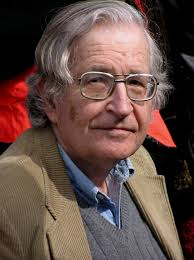 NOAM CHOMSKY: They should. But in actual fact, the degree of coalescence is not high. We should remember that—take Selma. If you listen to the rhetoric on Martin Luther King Day, it’s instructive. It typically ends with the “I Have a Dream” speech and the voting rights. And Martin Luther King didn’t stop there. He went on to condemning the war in Vietnam and to raising class issues. He began to raise class issues and turn to the North. At that point, he fell out of favor and disappeared. He was trying to—he was assassinated when he was trying to organize a poor people’s movement, and he was supporting a sanitation workers’ strike in Memphis. There was supposed to be a march to Washington to establish a poor people’s movement, appeal to Congress to do something about class issues. Well, the march actually took place after his death, led by his widow, ended up in Washington. They set up a tent city, a resurrection city. This was the most liberal Congress in history probably, tolerated it briefly, then sent in the police in the middle of the night and drove them out of town. And that’s disappeared from the rhetoric on Martin Luther King Day. So it’s OK to condemn a racist sheriff in Alabama, but not us, please. Don’t touch our privilege and power. And that’s a large part of the background. These issues are very real. There’s more issues here. Racism is a very serious problem in the United States. Take a look at the scholarly work on it, say, George Fredrickson’s study of the white supremacy, comparative study. He concludes, I think plausibly, that the white supremacy in the United States was even more extreme and savage than in South Africa. Just think of our own history. You know, our economy, our wealth, our privilege relies very heavily on a century of horrifying slave labor camps. The cotton—cotton production was not just the fuel of the Industrial Revolution, it was the basis for the financial system, the merchant system, commerce, England, as well. These were bitter, brutal slave labor camps. There’s a recent study by Edward Baptist which comes out with some startling information. It’s called—actually, the title is startling, something like The Half was Never Told [The Half Has Never Been Told], which is more or less true, was never told. But, for example, he shows, pretty convincingly, that in the slave labor camps—the “plantations,” we call them, politely—the productivity increased more rapidly than in industry, with no technological advance, just the bullwhip. Just by driving people harder and harder to the point of survival, they were able to increase productivity and profit. And it’s not just the—he also points out that the word “torture” is not used in discussion of this period. He introduces it should be used. I mean, these are camps that could have impressed the Nazis. And it is a large part of the basis for our wealth and privilege. Is there a slave museum in the United States? Actually, the first one is just being established now by private—some private donor. I mean, this is the core of our history, along with the extermination or expulsion of the native population, but it’s not part of our consciousness. Amy Goodman is the host of Democracy Now! and the co-author of The Silenced Majority.